Create Ultra HD in-wall, ceiling and air plenum HDMI cable installations, for applications requiring CMP rated cables. 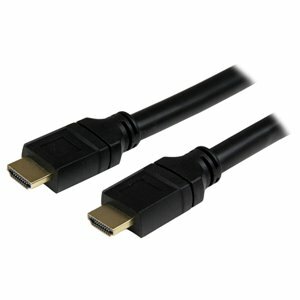 The HDPMM50 50 ft plenum-rated High Speed HDMI cable can be installed in air plenums, ducts, walls, conduits, ceilings, or anywhere else a CMP/FT6 fire rating is required.The cable features 2 gold-plated HDMI (male) connectors and durable construction to provide you with a dependable HDMI to HDMI connection between your A/V devices at a distance of up to 50 feet, without the need for a signal booster.This high quality HDMI cable fully supports 1080p+ resolutions at up to 120Hz refresh rate, with life-like color. To accommodate the demands of future high definition devices, such as increased resolutions and higher frame rates, this Ultra HD cable supports resolutions up to 4k x 2k. The HDPMM50 50 ft plenum-rated High Speed HDMI® cable can be installed in air plenums, ducts, walls, conduits, ceilings, or anywhere else a CMP/FT6 fire rating is required. Designed to accommodate the demands of future high-definition devices such as increased resolutions and higher frame rates, this cable offers a bandwidth of 340 MHz (10.2 Gbps) and supports resolutions beyond 1080p (up to 1440p) at 120Hz refresh rate with life-like color. This high-quality cable features 2 gold-plated HDMI (male) connectors and durable construction to provide you with a dependable HDMI to HDMI connection between your A/V devices at a distance of up to 50 feet, without the need for a signal booster.